Richard W. Nicholas, M.D., takes a seat in a chair given to him as part of the investiture ceremony, as College of Medicine Dean Pope L. Moseley, M.D., Chancellor Dan Rahn, M.D., and Corey O. Montgomery, M.D., look on. April 8, 2016 | April 8, 2016 | On the day reserved for his highest individual academic honor, Richard W. Nicholas, M.D., stressed the importance of teamwork. 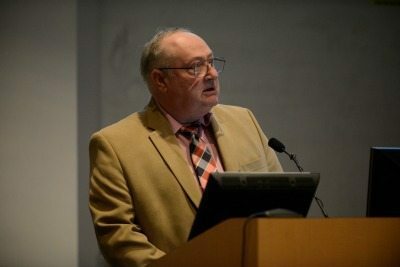 Nicholas, a professor in the Departments of Orthopaedic Surgery and Pathology in the College of Medicine and director of the Center for Bone and Soft Tissue Tumors at the Winthrop P. Rockefeller Cancer Institute, became the inaugural recipient of the Richard W. Nicholas and Corey O. Montgomery Chair in Orthopaedic Oncology in a ceremony March 31 at UAMS. An endowed chair is the highest academic honor a university can bestow on its faculty. A chair can honor the memory of a loved one or may honor a person’s accomplishments. An endowed chair is supported with donations of $1 million or more, with the chair holder using the interest proceeds for research, teaching or service activities. The chair was established by patients and their families, residents and alumni. It has the distinction of honoring both Nicholas and Montgomery, who are the only two orthopaedic oncologists in the state of Arkansas. It was a collegial, family atmosphere, with members of Nicholas’ family flying in from California, and multiple members of Montgomery’s family coming from Mississippi. Prior to the ceremony, Dr. Nicholas greeted each of Dr. Montgomery’s family in turn. Aubrey J. Hough, M.D., speaking at the investiture ceremony, called Nicholas and Montgomery “two princes” of medicine. 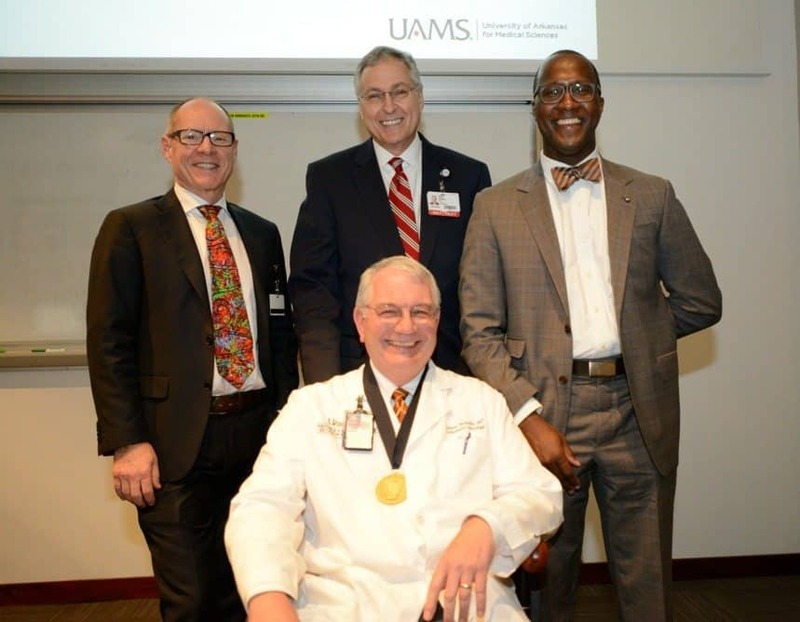 Speakers at the investiture included UAMS Chancellor Dan Rahn, M.D., and UAMS College of Medicine Dean Pope L. Moseley, M.D., who both presented a commemorative medallion to Dr. Nicholas. Other speakers included Peter D. Emanuel, M.D., professor of medicine and director of the UAMS Winthrop P. Rockefeller Cancer Institute; Kent C. Westbrook, M.D., distinguished professor of surgery; and Aubrey J. Hough, M.D., distinguished professor of pathology. Rahn noted the “rather unusual ceremony” of naming an endowed chair for two men. Nicholas developed the state’s only program dedicated to the study of orthopaedic tumors. He joined the orthopaedics staff at UAMS in 1989 to lead the Section of Musculoskeletal Oncology. From 1997 to 2003, he served as director of education at the Cancer Institute. He subsequently served as chairman of the Department of Orthopaedic Surgery from 2005 to 2013. Nicholas is a graduate of the College of William and Mary in Williamsburg, Virginia. He received his medical degree in 1981 from the Medical College of Virginia. He completed his internship and residency at the University of California in San Francisco and a fellowship in orthopaedic oncology at the University of Chicago. He is a member of the American Orthopaedic Association, the American Academy of Orthopaedic Surgeons, the Musculoskeletal Tumor Society, the Orthopaedic Research Society, the Children’s Oncology Group of the National Cancer Institute, the International Society of Limb Salvage, and the Mid-America Orthopaedic Association. Montgomery, who joined UAMS in 2010, is an assistant professor of orthopaedic surgery. He sees patients with bone cancer, soft-tissue cancer and metastatic cancer to bone. Montgomery is a graduate of Alcorn State University in Loran, Mississippi. He received his medical degree from the University of Tennessee School of Medicine in Memphis, Tennessee, followed by his residency in the UAMS Department of Orthopaedic Surgery. In 2009, he completed a Musculoskeletal Oncology Fellowship at the University of Miami/Jackson Memorial Hospital in Miami. Montgomery is a past recipient of both the UAMS Orthopaedic Outstanding Resident Teaching Award and the Carl L. Nelson Leadership Award. In his acceptance speech, Nicholas thanked both families, as well as the donors. But he reserved his highest recognition for Dr. Montgomery. “He’s helped build this program into what it is,” said Nicholas. Noting that this is the first endowed chair at UAMS named after an African-American, Nicholas became emotional. “I couldn’t be prouder that it’s Corey,” he said, his voice breaking, as the audience rose for a loud and sustained ovation. After the ceremony was complete, both Nicholas and Montgomery took turns seated in the chair, posing for pictures as a group with each of their families.